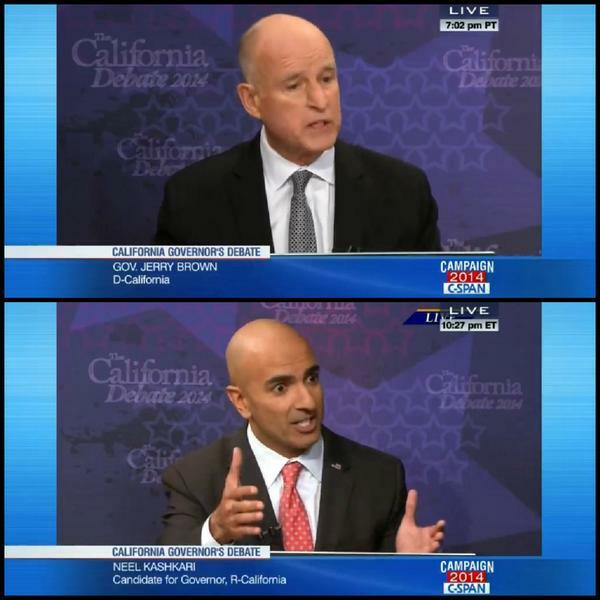 To recap: Kashkari distanced himself from GOP on gay marriage, climate change, and tonally with bipartisan pitch. Won't see that in 2016. As veterans go, @jerrybrowngov fared better tonight than @rogerfederer . But latter now serving for the 4th set. Good things about tonight's debate: No spin room or candidate talks, both usually intended to tell reporters they didn't see what they saw. CA debate a reminder of how impt political branding is: @JerryBrownGov has had 40 years to craft image of fiscal moderation that defines CA.